I am so honored to be a guest blogger for Nettie today. I am a huge fan of Nettie and all of her recipes! Here’s a little background on me… I am a recipe developer, food blogger and the staff Nutritionist at The Bar Method in Montclair, NJ where I offer workshops and individualized counseling. I have written two cookbooks which I am incredibly proud of, The Everything Wheat-Free Diet Cookbook and The Greek Yogurt Cookbook. I’m happy to share my healthy and delicious recipes with all you. 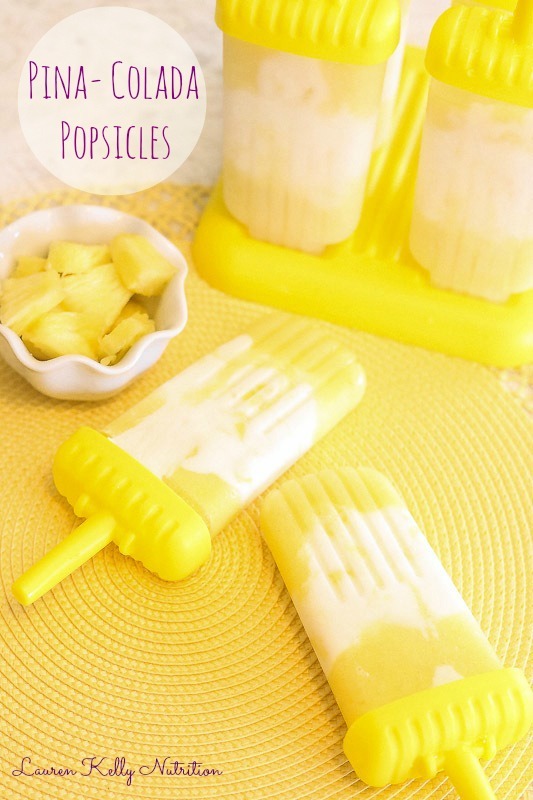 I didn’t make these popsicles alcoholic, but if you’d like to add some rum to the yogurt/milk mixture, go for it! Maybe make half of them with rum and half without. This way when your kids enjoy their treat, you can have your “adult treat”. Everyone wins! And with only 3 healthy ingredients, they are simple to make and delicious. Take remaining pineapple and blend in blender until smooth, but you can leave it as chunky as you’d like. Perfection in a popsicle, love it!! Pinning!! Oh wow, these look/sound great! Pinning to try when the weather gets warmer.